Deer and elk have been maimed and killed by motorists for many years at numerous places along state Highway 75 in the Wood River Valley. 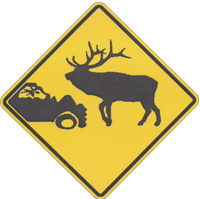 Some motorists also have been injured as a result of animal-vehicle collisions. The Blaine County Transportation Committee has formed a subcommittee to look at possible solutions to the problem, including signs warning motorists and motion sensors able to detect animal movement on and nearby roadways. After several months of research and discussion, the committee decided Wednesday to seek funding from the Idaho Transportation Department for “nontraditional” warning signs and an animal detection system that has proven to be effective in reducing vehicle-animal collisions in northern Idaho. The animal detection radar system was developed to protect military convoys in Iraq and Afghanistan by Sloan Security Technologies. The system works by using radar to detect movement, and sends flashing warning lights to motorists when animals are present. Data gathered from each radar system can be used to study animal movements at a distance of up to a quarter of a mile. The cost of the systems to Blaine County would be from $40,000 to $100,000, depending on how many radar systems are purchased, and where they are located. “We shouldn’t discount this idea due to a lack of money,” said committee member Alan Reynolds. Reynolds suggested seeking private funding from nonprofit organizations and large foundations in the Wood River Valley. The committee made a list of potential donors, including the Idaho Conservation League, The Nature Conservancy and the Blaine County Land, Water and Wildlife Levy fund. Studies have shown that year-round, herds of deer and elk cross Highway 75 in large numbers each morning and night, near Gimlet Road, East Fork, Peregrine Ranch and Bellevue. Committee member Roger Olson, a retired Idaho Department of Fish and Game conservation officer, said the persistence of deer and elk at Peregrine Ranch north of Hailey is due to an irrigated berm that is covered with grass and trees and runs for about a mile on the east side of the highway. “The berm is a big buffet line for elk,” he said. Committee member Mary Jane Conger called for more attention to the northern part of the highway, between East Fork Road and St. Luke’s hospital. She also said Peregrine Ranch will eventually be built out, leaving the herds with less room to roam and graze in the existing alfalfa fields. The radar detection systems can be installed on power poles, or on trailers for mobile use. Reynolds said he would seek further information on the range of the system, and how effective it is on stretches of highway surrounded by trees. Committee member and Idaho Transportation Department spokeswoman Connie Jones said she would request portable messaging signs from ITD immediately to warn motorists of herds crossing the highway this fall. A night speed limit of 45 mph along a 2.5-mile stretch of Highway 75 between McKercher Boulevard in northern Hailey and Zinc Spur Road was put into effect in October. Wildlife Crossing Committee member Kaz Thea said last month that the lower limit, from 55 mph, has had a “huge benefit” in reducing collisions with wildlife.